MapleStory 2 is the sequel to Nexon’s massively popular fantasy MMORPG and it has finally launched as a free-to-play title in the West. To celebrate, we’re holding a big giveaway right here, in which you can win lots of goodies to ensure you get the best start you can in this new and exciting world. In MapleStory 2, you can begin your journey alone or in a team with friends. From there, you can embark on quests, explore mysterious lands, and defeat new enemies and familiar foes in the colourful 3D landscapes of the MapleStory universe. MapleStory 2 is known for being a highly customisable RPG that gives you the creative tools to craft and build whichever look you want. You can customise your avatar from their facial features and outfits to their accessories and even their gear. Plus, when you get further into the game, you have the chance to make the most of the building tools to create your own home. If you’re more into the questing and combat then you’ll be glad to hear that MapleStory 2 gives you the choice of nine different classes. The most recent addition is the Runeblade, which has a good balance of powerful melee attacks and elemental spellcasting. Runebladers stop at nothing to hunt down and wreak vengeance on traitors to the order. They’d be quite scary if it wasn’t for the game’s bright colours and cute chibi aesthetic. MapleStory 2 is free to download right now. To give yourself a head start make sure you enter our giveaway. 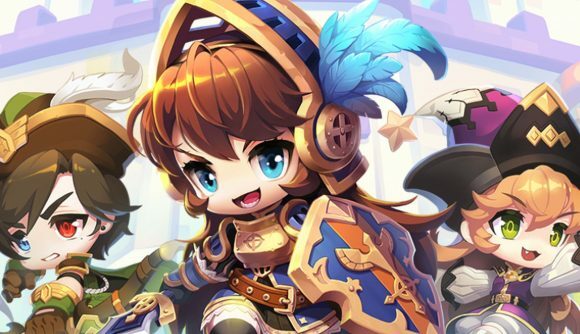 We have 40 MapleStory 2 Founder’s Packs worth $40 – yep, even though they’re no longer on sale we have a bunch to give away for free. Specifically, it’s the Explorer’s Package that we have, which comes with 30 days of premium club membership, a mark of the founder beanie for your avatar, a fancy founder’s Regalia name tag, 2,000 blue Merets for you to spend in-game and, wait for it, a Prismatic Harmony Unicorn that you can majestically ride around. In order to win a code for an Explorer’s Package, all you need to do is enter the competition via the widget below. Every action you complete is worth one entry, too, and you’re allowed to enter several times – increasing your chances of winning.